Colby here, David normally writes the San Diego Bucket List posts, but he edited this week’s video (see below), so partnership. I don’t even remember how we heard about Ho Chi Minh Trail in San Diego. Probably Pinterest, which is where I get most of my travel ideas. I remember seeing a really cool picture of people climbing between rocks and that was enough for me to it put on our San Diego Bucket List. Ho Chi Min trail is not an “official” hike per se. Surfers and locals maintain the trail, therefore, it can be dangerous, especially after rain. Because it is not a well-known, public trail it was difficult to find information online about the trail. One website read, the entrance is between “two dark brown fences”. OK, easy enough. We knew the general vicinity of the trail, so we figured we could find the two dark brown fences. Turns out we couldn't. About 10 feet down the path we realized we were not on the right trail. It was a large, wide pathed road. We decided to walk all the way down the path in hopes of finding the trail along the way. Unsuccessful. We finally reached the beach where we proceeded to walk a mile or so north. We spotted a family walking down a cliff using a rope- that had to be it. We were correct. We found the correct Ho Chi Min trail. The trail is narrow and steep. I slid in mud about two minutes into the walk. We are used to climbing down cliffs to get to the beach in front of our house, but this was a little more treacherous than we were used to. The trail winds through two large cliffs which makes for some beautiful scenery. At one point you have to climb through two limestone rocks. It is narrow and I recommend getting some momentum as it is easy to get stuck (I did, David didn’t). You also have to cross a 15 foot 2x4. Fortunately, it is not too high but may be intimidating to some. The trail is 0.6 miles one-way. It looks us about 30 minutes and we were stopping for lots of pictures and video. 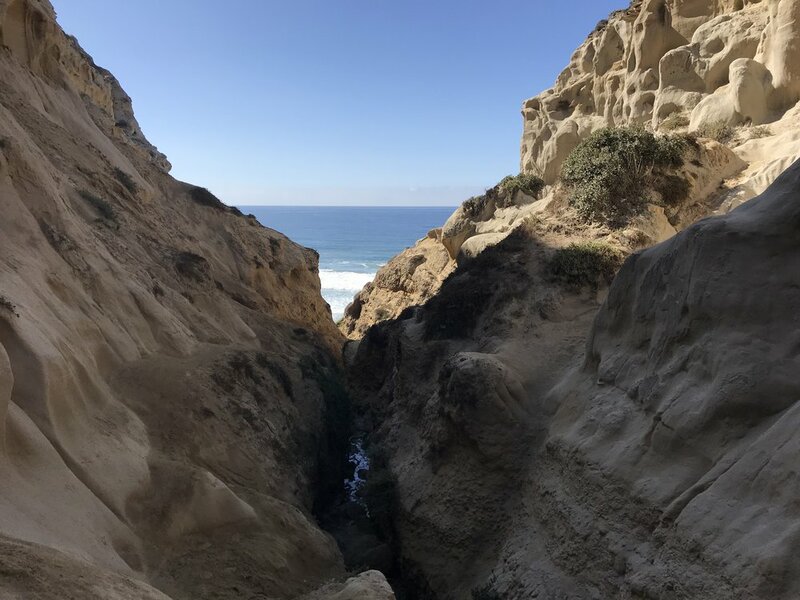 I would recommend the trail for people looking for a creative way to get to a beach in La Jolla Shores. Otherwise, just take the road and ensure a safe arrival at the beach.